The ship's hull was painted in royal blue and gold. The decorations are shown in the model in very detail. 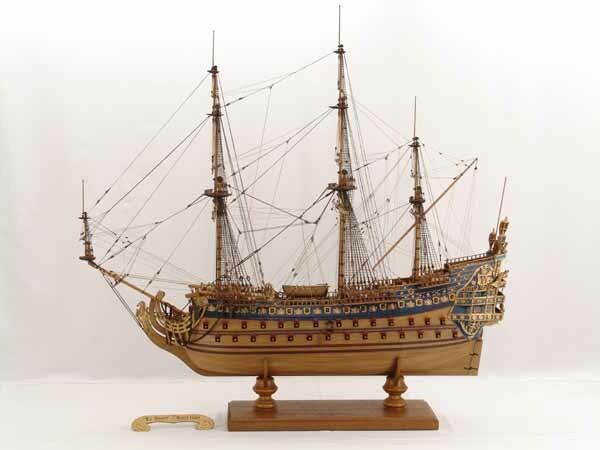 The excellently worked model of the SOLEIL ROYAL clearly shows the impressive lines of hull and rigging. The model is 1 : 77 scale. Length is 103 cm, width 46 cm, height 102 cm. The ship model is not fixed to the stand but could be taken out, e.g. for transport. Have a look at the set of photos. There are several views of the entire model and close views of hull, rigging and decorations. Click images to enlarge!